The computer is used to draw the design. CAD - Computer Aided Design software is used for this purpose. However, the design is only a picture and the CNC machine cannot use this to manufacture the product. The computer software must also convert the drawing into numbers (coordinates) that the CNC machine can use when it starts to cut and shape the material. 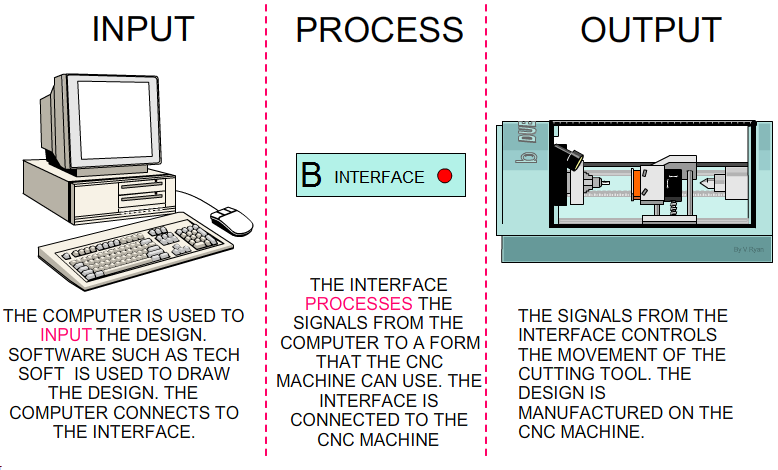 A computer cannot be directly connected to a CNC machine. The computer is connected to an interface. Modern CNC machines have a ‘built in’ or integral interface, which appears part of the CNC machine. This circuit converts the signals from the computer to a form that the CNC machine understands. Older CNC machines have a separate ‘box’ called the interface. The signals are in the form of digital signals when they are sent to the CNC machine. CNC (Computer Numerical Control) Machine. The signals from the interface control the motors on the CNC machine. The signals determine the way the vice moves. The vice moves in three directions X, Y and Z. (Horizontally, vertically and depth). The signals also control the speed of the cutting tool. The whole process of designing and making an item on the CNC machine can be split into three aspects INPUT-PROCESS-OUTPUT. The diagram below explains this system. Draw the systems diagram shown above and explain what happens in the INPUT, PROCESS and OUTPUT sections.